As the summer squash crops are beginning to appear at the farmers’ market, so are their delicate blooms. I’ve always been intrigued by squash blossoms, the vibrant edible flowers that bloom from the ends of zucchini & other squash varieties. 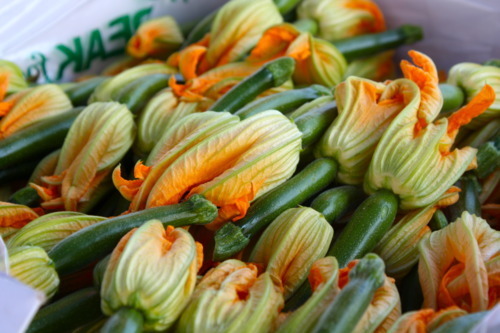 Squash blossoms can be enjoyed raw or cooked – slice & add to a raw salad, or stuff, batter & fry for wonderful taste sensation. Squash blossoms have been on my mind lately. Last week I went to a restaurant who had them as an appetizer special, but stuffed with jack cheese, so I passed, but it reminded me that I’ve been dying to try the stuffed version – with a bit of my favorite cashew goat cheese, of course. Then I saw a post on Facebook from Suzie’s Farm, my CSA, announcing that they had squash blossoms available at the stand & should be enjoyed tucked inside a quesadilla. My wheels got-a-turning, so when I went to the market to pick up my share, I nabbed some squash blossoms as well. Then I headed across the street to Fresh & Easy & discovered their Jalepeno & Cilantro Tortillas, Mango Salsa & picked up some Daiya mozzarella. 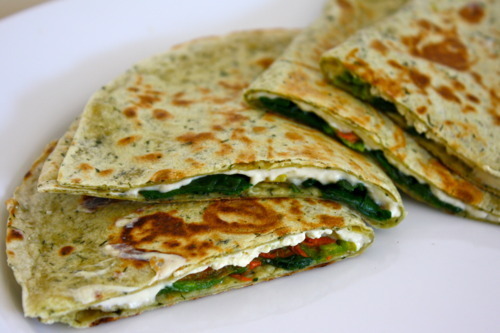 I would like to try this with the pepper-jack, but have had a hard time finding it, so mild mozz it was. Prep blossoms by removing the stamen & stems. Gently wash & pat dry, then chop. Heat one teaspoon olive oil in a pan. Add spinach & blossoms & cook over medium-high heat, until wilted. Remove from heat & set aside. I mixed some mashed avocado with the mango salsa for dipping. I loved the balance between the spicy tortilla with the mild cheese & filling. So yummy! I’ll be making different variations of this for sure! Enjoy! Pistachio, Cherry & Chocolate Tart – Veganized!